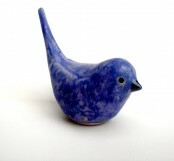 The symbol of a bluebird as the harbinger of happiness is found in many cultures and may date back thousands of years. Join us to learn basic hand building techniques to build your own blue bird of happiness. Fun for the whole family! This is a non-school day. 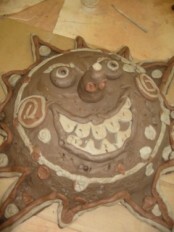 The students will learn basic clay techniques to build high fired ceramic sun sculptures. Make a beautiful treasure. 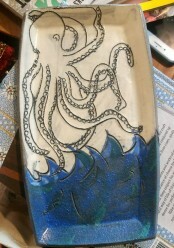 Everyone loves to look at sea life in a tidepool and this is your time to create your own. Students will learn to create the bowl and sea animals using basic clay hand building techniques. The students will learn basic clay techniques to build high fired animal platters. They can be personalized to look like an animal you know or ideas from the instructor.